Neftali Soto hit by pitch. Xavier Paul singles on a sharp ground ball to second baseman Darwin Barney. Neftali Soto to 3rd. 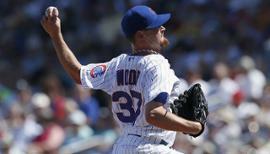 March 24, 2014 Chicago Cubs released RHP Chang-Yong Lim. March 6, 2014 RHP Chang-Yong Lim assigned to Chicago Cubs. February 2, 2014 RHP Chang-Yong Lim assigned to Iowa Cubs. January 22, 2014 Chicago Cubs signed free agent RHP Chang-Yong Lim to a minor league contract and invited him to spring training. December 2, 2013 RHP Chang-Yong Lim elected free agency. September 4, 2013 Chicago Cubs selected the contract of RHP Chang-Yong Lim from Iowa Cubs. August 24, 2013 Chang-Yong Lim roster status changed by Iowa Cubs. August 16, 2013 Iowa Cubs placed RHP Chang-Yong Lim on the 7-day disabled list retroactive to August 13, 2013. July 27, 2013 RHP Chang-Yong Lim assigned to Iowa Cubs from Tennessee Smokies. July 24, 2013 Chang-Yong Lim assigned to Tennessee Smokies from Daytona Cubs. July 12, 2013 Chang-Yong Lim assigned to Daytona Cubs from AZL Cubs. June 24, 2013 Chang-Yong Lim assigned to AZL Cubs. December 17, 2012 Chicago Cubs signed free agent RHP Chang-Yong Lim to a minor league contract.